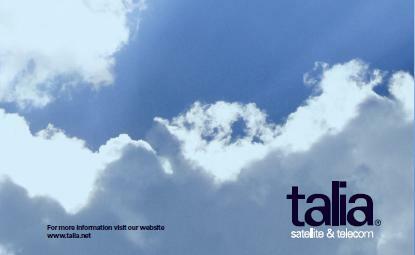 Talia is a Satellite Internet and voice service provider in the Middle East, Africa, and Europe. With expertise in VSAT, wireless, and voice communications, Talia provide network coverage, services and support in the Middle East, Africa, and Europe. Talia headquarters are based in London and there are branches in UAE, Iraq, Germany and Nigeria. The company is committed to excellent customer service and top-grade solutions using reknown iDirect technology. Our services are at our teleport. We offer both iDirect and dedicated services, as well as SOHO services. C band coverage beam from Arabsat BADR-6 satellite at 22.6 deg East. Talia features service on satellite Arabsat BADR-6, orbiting geosynchronously at 26�E. Operated by Arabsat, BADR-6 is designed to provide a package of communications services (digital TV, telephony, videoconferencing, data transmission, and Internet access) and to deploy satellite networks by applying VSAT technology. Talia features service on satellite Arabsat-5A, in geostationary orbit at at 30.5�E. Arabsat-5A, a Eurostar-3000 model, is operated by Arabsat and equipped with a payload featuring 16 active transponders in C-band. Arabsat-5A is designed to provide additional capacity for a large range of satellite communications services such as television backhauling and broadcasting, telephony, business communications, Internet trunking and the provision of VSAT and other interactive services, over sub-Saharan Africa, North-Africa and the Middle East. Telstar 11N at 37.5 deg West, Ku band Africa downlink beam coverageTalia features service on Telstar 11N, located at 37.5�W. Telstar 11N utilizes 39 high powered Ku-band transponders to support a wide range of video and data applications in Africa and Europe, North America, and across the Atlantic Ocean. Operated by Telesat, Telstar 11N African coverage is promoting the implementation of broadband and video services across the continent and enabling a broad range of users to seamlessly connect their African operations with Europe and North America. I have written this page at the request of Talia. The information and images are derived from information provided by Talia and are used here with their kind permission. This is not a paid for advertisement. All pages on this satsig.net web site are Copyright Satellite Signals Limited � 2009 all rights reserved.